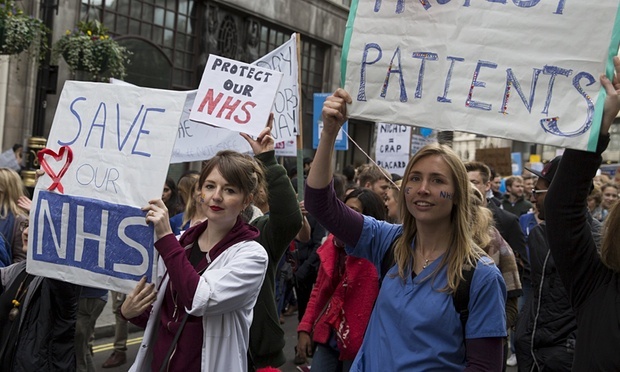 The leader of NHS junior doctors in England has urged Jeremy Hunt to stop treating them like “the enemy” and instead reopen negotiations in a bid to stop their threatened strike. Dr Johann Malawana told the health secretary he must stop lambasting junior doctors if he wants to settle a long-running dispute over his threat to introduce new NHS contracts. “Stop attacking us. We are not the enemy. We are just health professionals who want to have a meaningful discussion. Talk to us, talk to us reasonably. Stop going to the press claiming that we are scaremongering”, said Malawana as he addressed a protest rally in central London attended by many thousands of junior doctors, their families and other health service personnel.